Tag Archives for " upsholstery cleaning "
attachment and crevice tool. Turn removable cushions weekly to ensure even wear. Depending on the fabric type you can wash or dry-clean loose covers. If you wash them, replace them before they are completely dry to re-shape and stop any shrinkage. You will need to iron them in position, using a cool iron on foam furniture (do be careful I’d hate for your to scorch your lovely cushions). 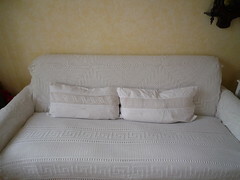 If the covers cannot be removed, have them professionally cleaned, or clean with an upholstery shampoo and spotting kit. Always test on a hidden area first and make sure you don’t over wet the cloth. I suggest you dry-clean chenilles, velours, tapestries, velvets and fabrics containing silk, wool or viscose.